These pictures were taken with a new Canon EOS 10D digital SLR. I set it to full-manual, using exposures of mostly one to four seconds, at f/11 to f/22, at ISO 100. I used an EF 28-70/2.8L zoom, set wide-open and left on manual focus at infinity. Because of the smaller-than-full-frame sensor, this was equivalent to a 45mm lens, and wider would have been better. Using a digital camera was great, as it allowed me to evaluate the effects of various exposure settings at the time, in this tricky and difficult-to-repeat setting. I had my tripod at full extension and did not have a remote release, so some of the pictures may be a bit wobbly. The sky did not actually look so black; this attractive effect was the result of using small apertures to suit the brightness of the fireworks, not digital manipulation, of which there is very little in these images. Another advantage of digital is being able to take so many pictures, since timing is difficult, and one never knows how they'll turn out. 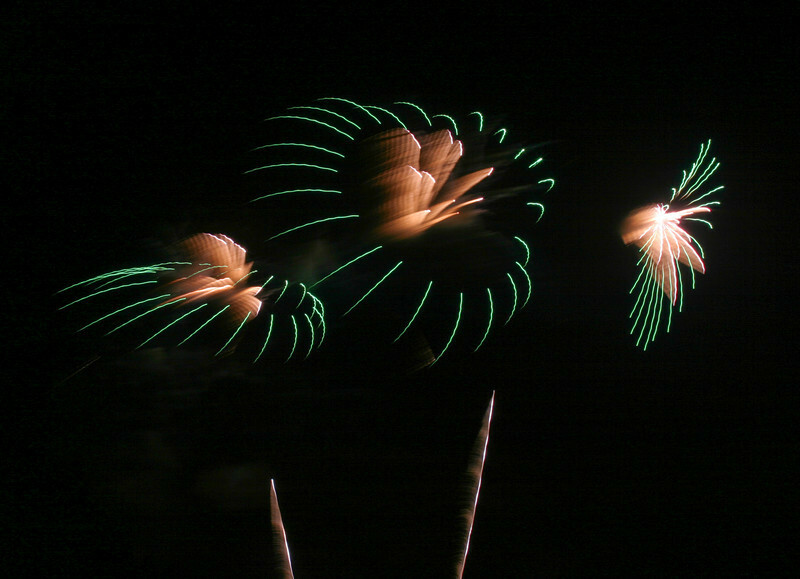 These were culled from about 120 total exposures, so I had the shutter open for a total of about two minutes of the thirty-minute-odd show! Even longer as well as shorter exposures would have been fun to try. As it is, I'm pleased at the unexpected resemblances to diaphanous insects and deep-sea creatures.